Digital Purchase Order is a cloud-based e-procurement software that allows users to create and send purchase orders online. Using this tool, the finance & procurement teams can create purchase orders and identify & select the most appropriate vendor from a drop down list. The software also replaces the manual task of circulating a purchase order from one person to another by building an approval chain within the same system. Multiple levels and comments can be added to the approval chain and automatic notifications are sent to the vendor when the final purchase order is sanctioned. Users can review purchase orders by department or by supplier and can also use other features such as filters, sort options, role-based access and keyword searches for managing orders. Digital Purchase Order allows users to include the company logo in their reports as well as offers an admin section which can be used for customizing purchase order numbers, department names and the type of expenditure incurred by the company. The product helps to ensure transparency in the procurement process by creating a purchase order system where the decision makers and senior management can approve costs beforehand. The software ensures the security of data using SSL encryption standards and works well with multiple languages and currencies. The application can be accessed through mobile apps for Blackberry, Android & iOS phones and any type of web browser. Great overall experience, easy to use system which allows staff to lodge PO's on the run and office staff to control costs effectively.We loved the fact that it was easy to use and upload our accounts structure to. The App really made a difference for our guys to make purchase orders on the run. The web interface also was easy to use and administer. Setting authorization/purchase limits for users was a great function. We loved the fact that it was easy to use and upload our accounts structure to. The App really made a difference for our guys to make purchase orders on the run. The web interface also was easy to use and administer. Setting authorization/purchase limits for users was a great function. Limited user base for the price of the product, expenses when you have to run multiple PO books (different subsidiaries). I've used Digital Purchase Order for one year and it has been great. It's very user-friendly and the representative has given great and prompt customer service any time I've needed help. I do wish the mobile app was a bit more easy to use and more similar to the desktop version but for now, it is still a good tool.Very easy to use and helps me keep track of my purchases. Very easy to use and helps me keep track of my purchases. The app needs more work. It takes more time to use it if you are used to the desktop version because it is very different. I wish that the fields to be filled out were prompted in the same order that they are in the desktop version. We have been using this for about a year now and it works well once everyone has graduated from a short learning curve.Can track and process PO's digitally and from your mobile phone. Links with accounting software. Can track and process PO's digitally and from your mobile phone. Links with accounting software. The menu for administration options are a little bit cumbersome to set at first. easy to use, the app is very convenient, keeps everything organized, totally paperless, easy to add/remove users. There are frequent times when the software stops working and appears to go down without notice. These are typically fixed quickly, however it is still an inconvenience. ●	Digital Purchase Order replaces the paper system of placing orders and keeps a record of all transactions in order to prevent duplicate payments. ●	Users can track payments, keep a check on expenses and overpriced bills are not paid unless there is an amendment to the approved purchase order. ●	The solution offers a fully automated approval process that helps users to optimize the time taken to accept the purchase order request. ●	Purchase data can be exported into a CSV file once a day and used outside the system for further calculations on accounting and cost management. ●	Digital Purchase Order supports multiple currencies and allows users to convert from one currency to another using custom exchange rates. 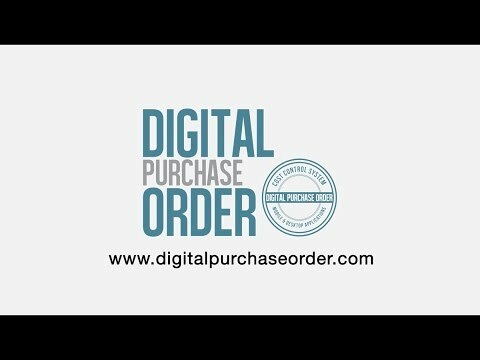 Below are some frequently asked questions for Digital Purchase Order. Q. What type of pricing plans does Digital Purchase Order offer? Q. Who are the typical users of Digital Purchase Order? Q. What languages does Digital Purchase Order support? Q. Does Digital Purchase Order support mobile devices? Q. Does Digital Purchase Order offer an API? Yes, Digital Purchase Order has an API available for use. Q. What other apps does Digital Purchase Order integrate with? Q. What level of support does Digital Purchase Order offer? Q. Which apps is Digital Purchase Order compared to most often?